Is nothing sacred? The newshounds exploit Martin Luther King Day to attack black Americans...and to make one disappear. And there’s the catch. Fox “News” uses the legacy of Martin Luther King, Jr., to reinforce Right Wing Talking Points and Fox “News” memes. The practice reaches its height on Martin Luther King, Jr., Day, which always falls on a Monday for the 3-day weekend. Really? It always falls on a Monday? How revelatory. Wait! Who died and made Daniel Denvir, whoever the frack he is, God? What does Denvir have to do with this? Other than writing a year-old attack piece on Alveda King: nothing. Anti-Americann cites quote after quote from Denvir to obscure the fact that ‘Aunty’ cites nothing--not one statement--from Alveda King’s interview. It’s basically: hey there was an interview, Alveda King is bad, here’s an irrelevant hit-piece to muddy the waters, figure it out yourself. Wait? 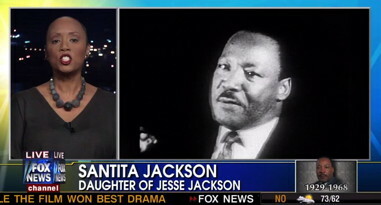 Is that the same Santita Jackson who is the daughter of Jesse Jackson? Who produced Jesse Jackson’s broadcasts? Who writing is published by thegrio.com? The answer is, yes. And she is about as far as humanly possible from the ‘right wing talking points’ and ‘memes’ ‘Aunty’ was insisting permeated Monday’s Fox & Friends. 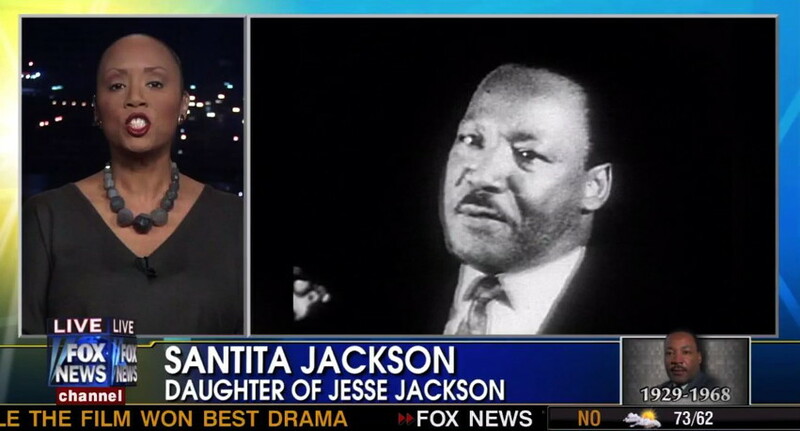 Fox gave Santita Jackson a full program block to talk about Dr Martin Luther King from her perspective, and her statements conflicted so blatantly with Anti-Americann’s chosen smears about ‘talking points’ that ‘Aunty’ had to lie and pretend that Ms Jackson didn’t exist. So he dishonestly claimed only ‘two separate guests’ talked about the King legacy. Yes, He-Who-Shall-Not-Be-Named lied by omission to hide the empty dishonesty of his own phony smear. In other words, another day’s work for Anti-Americann.